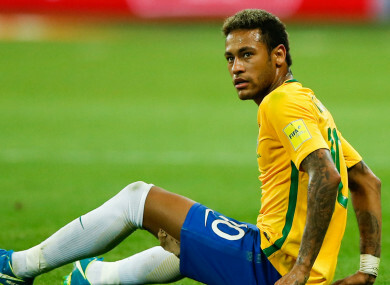 Neymar is due to lead Brazil's attack in Russia. NEYMAR FACES UP to three months on the sidelines after the Paris Saint-Germain forward undergoes surgery on his broken foot, Brazil’s national team doctor has confirmed. Despite head coach Unai Emery initially appearing resistant to the idea, with an eye on next week’s Champions League showdown against Real Madrid, the Ligue 1 leaders confirmed yesterday that Neymar would need an operation after fracturing the fifth metatarsal of his right foot during last weekend’s 3-0 win over Marseille. The operation will take place on Saturday and Dr Rodrigo Lasmar from Brazil’s national team set-up delivered worrying news for the Selecao ahead of the World Cup in Russia. “It was a small fissure, a major fracture of a bone in the middle of the foot, and the operation will be on Saturday morning in Belo Horizonte,” Dr Lasmar said, as quoted by Globo TV. We do not have the right time, but it will certainly be that day. It’s two and a half months, three months of recovery. After surgery we will have more details about this time. Email “Neymar's debut season with PSG is over, Brazil star now faces race to be fit for the World Cup ”. Feedback on “Neymar's debut season with PSG is over, Brazil star now faces race to be fit for the World Cup ”.